Scientists claim Saturn's rings are being pulled into the planet by its magnetic field, resulting in a daily storm of dusty rain and ice particles. At the rate it's going, Saturn's iconic rings could disappear in the next 100 million years, according to new NASA research. "We estimate that this 'ring rain' drains an amount of water products that could fill an Olympic-sized swimming pool from Saturn's rings in half an hour," said NASA's James O'Donoghue. Donoghue goes on to say that the planet's entire ring system could be gone in 300 million years. "We are lucky to be around to see Saturn's ring system, which appears to be in the middle of its lifetime," O'Donoghue said. "However, if rings are temporary, perhaps we just missed out on seeing giant ring systems of Jupiter, Uranus and Neptune, which have only thin ringlets today." 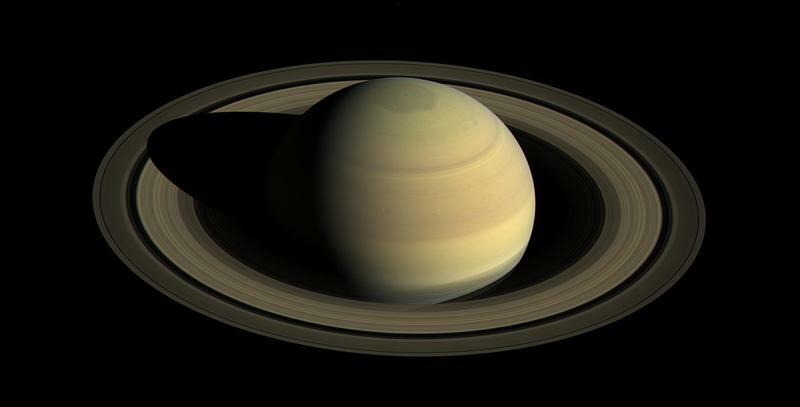 The new NASA research also revealed that Saturn's rings may have formed when small, icy moons near the planet collided. While the rings will still be around for at least 100 million more years, you have to remember that the rings themselves are estimated to only be about 100 million-years-old, which is young by cosmic standards. The GIF below is an artistic representation of what Saturn may look like when its innermost rings disappear.